The daith piercing is a type of ear piercing, which pierces through a thin bit of cartilage in the inner rim of the ear- right through a pressure point. It's becoming more and more popular within society, as it is often thought of us "daring" and "painful". What it isn't thought of as being, however, is beneficial- and new studies show that it might be just that. A study by the US based National Headache Foundation found that almost 30 million Americans are plagued by migraines and headaches each year. Most of these people turn to traditional over the counter pain medications, but some professionals like Tammi Bergan, NP, of ERiver Neurology, are attempting to sway their patients toward natural methods, such as acupuncture, and in some cases, daith piercings. Daith piercings are placed in a location on either ear that is also a pressure point, therefore, for some patients, they can relive pain and anxiety. 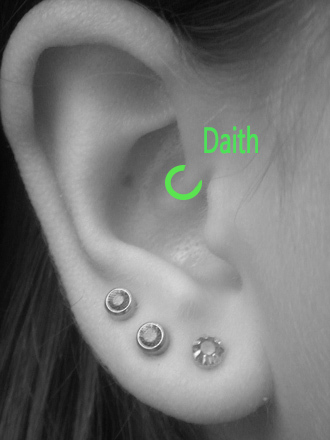 For believers of alternative medicine, the daith piercing is often a good way to go. A woman by the name of Kimberly reported that she has been suffering migraines for for over a year, if not longer. Kimberly got a daith piercing a month ago. When asked about the daith piercing, many of my friends have recommended it, claiming that it really does ease pain and lifts anxiety when the piercing is rubbed or touched. Is the pain relief all in my head? Some people, skeptics and believers alike, say that the pain relief resulting from this piercing is a simple "mind over matter" trick. If the wearer believes that the piercing eases pain, it more than likely will. Would you consider the daith piercing?